what they do when clicked. Optionally, as with all menu commands in XYplorer, you may assign keyboard shortcuts to them. You have to visit D:\Company\Projects\2008\MarsLanding\TopSecret\ about 25 times a day, 7 days a week? What about having a keyboard shortcut, e.g. Ctrl+Shift+M, to bring you there? Select category "Go To" and click button "New". Paste D:\Company\Projects\2008\MarsLanding\TopSecret\ into the Location field, and MarsLanding into the Caption field. Click button "Assign Keyboard Shortcut..." and select Ctrl+Shift+M. 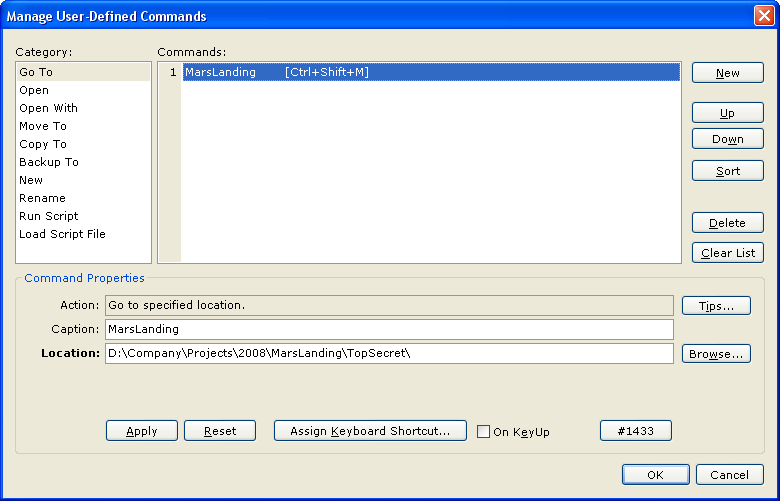 Click button "Apply", and Exit the dialog with "OK". Pressing Ctrl+Shift+M now will beam you up to D:\Company\Projects\2008\MarsLanding\TopSecret\ instantly from wherever you are (provided, of course, that folder exists). It's as simple as that! 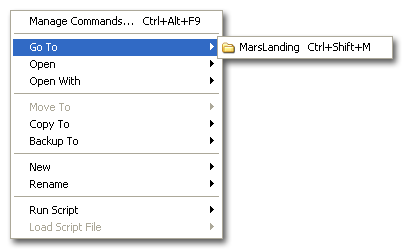 A corresponding new menu item "MarsLanding" has been automatically created under menu User | Go To. There's a URL on the clipboard you want to visit with Firefox? A UDC of type "Open" is the fastest way to do it. Just set Item to "C:\Programme\Mozilla Firefox\firefox.exe" <clipboard> (adjust the path to your system, of course! ), and assign e.g. Ctrl+Alt+F as keyboard shortcut. Now you can open URLs stored in clipboard using Firefox with a simple key combination. This page has been written 2008-05-08. The screenshots don’t reflect the current look of the application. Some of the functionality might have been changed or enhanced in the current version.